It is a well-known fact that Mumbai real estate reflects a narration of the revolutionization of Indian real estate. The reason why Mumbai real estate has sky touching prices today is because the real estate in India has witnessed more than just a significant transformation in the past 10 years. There is a positive trend in the Mumbai real estate market due to some very obvious reasons solely applicable to Mumbai like rapid urbanization and high employment opportunities. Other factors that have played a vital role in increasing the demand in the market are the torrents of construction activity and the initiatives taken by the government for affordable infrastructure growth. If we look at the increase of the housing prices across Mumbai, it is evident that there is a myriad increase in the last few years, the reason being none other than the ever increasing demands for residential units in the city. 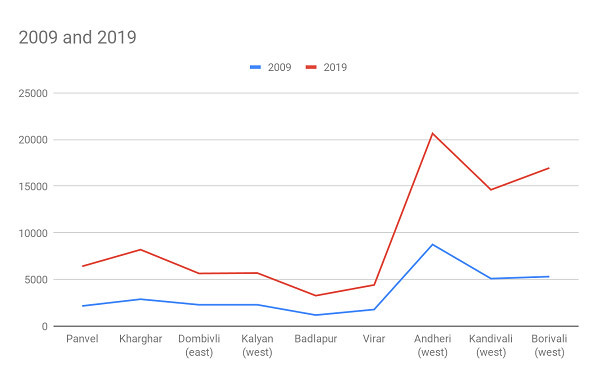 A historical data representation shows an increase in price by 250% in the micro-markets of Mumbai metropolitan regions. 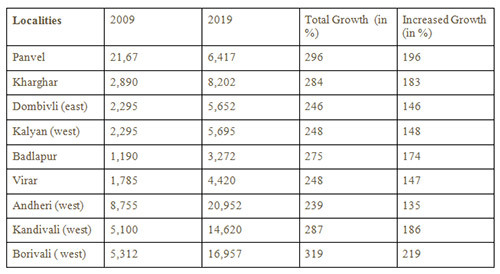 To explain further in details, below is a Table and Graph representing a few metropolitan regions within Mumbai, with the increase in their property prices from 2009 to 2019. Trailing close behind Borivali is Panvel located in Navi Mumbai with the growth percentage of 296 percent. One of the major factors that have led to an increase in the property prices in Panvel is that it has one of the fastest growing areas in terms of infrastructure development and connectivity. One of the leading factors that have led to the growth of the estate activities in Panvel and increase in land values in the region would be the Navi Mumbai International Airport coming up next to Panvel. Keeping the last 10 years in the picture, some of the major infrastructural developments in Mumbai would include the Monorail, Double decker Flyover, special corridors initiated for high-speed Trains, Eastern Freeway, coastal road, Goregaon Flyover, elevated rail corridor from Bandra to Virar, T2 terminal and the persistent metro expansion that have resulted in increase of value and price of the properties that are situated next to these constructions.. These infrastructural developments have majorly contributed in shaping the fortunes of realty growth in Mumbai. Migration of people wanting to fulfill their Dreams. Mumbai is considered as a city of dreams and possibilities. Desires like being a part of Bollywood or making your presence shown seems next to possible only in Mumbai. Mumbai has one the biggest multinational companies, top-notch healthcare facilities and immense job opportunities. Above mentioned are some of the most common reasons to migrate to this city. Rapid growth of metropolis has caused the property prices to escalate in Mumbai. Mumbai has been one of the cities that has been receiving a helping hand from Maharashtra Real estate Regulatory Authority. Since 79 percent of the cases registered with Maharera have been decided in favour of the aggrieved customers and the work transparency has revived the interest of the homebuyers in the realty sector, the demand for residential units in Mumbai have been escalated majorly. Due to which there has been a major escalation in the property prices across Mumbai. Not only has Mumbai attracted people due to its immense infrastructural expansion, it has also taken an oath to keep developing through the years, which in turn promises people for better lifestyles. There is a constant awareness about the increase in price of the property due to constant development of nearby infrastructure. Mumbai is all set to scale new endeavors regarding the infrastructural developments in the coming years. Some of the major developments that will not only promise change in the lifestyles of the people but also a drastically escalation in property rates would include Expansion of metro, Navi Mumbai international Airport, Mumbai Trans Harbor Link, Virar- Alibaug multimodal corridor, CST- Panvel rail corridor and Mumbai-Nagpur Expressway. Real estate in Mumbai conclusion : With the view of the already established infrastructural accessibility and upcoming factors along with the increasing demand for residential units in Mumbai, it can be rightly presumed that the property price and value in Mumbai are probably only going to see some escalation and further intensification in the coming years. Is Property Investment in Nagpur Really Worth It? Discover the trends and reports that shape the dynamic Indian real estate industry.